If you want to be a golfer who has the right shot for every occasion, you need to be able to control distance, spin, curvature, and trajectory. We will reduce direction, the fifth characteristic of a golf shot, to being able to hit a straight ball and assume that you already know how to do that, since the other four controls are variations of this shot and depend on your being able to hit it. Please don’t think, though, that I’m going to tackle that project in this post or in a series of posts. I want you to really learn how to do all those things, not just get a general idea, and you do that by signing up for a series of lessons of your own design. This is what you would tell the pro you want to learn. Say you hit your 7-iron 145 yards. To get the ball close to a pin with a 7-iron, that one distance isn’t enough. You need to know how to hit it anywhere between 133 and 145. That’s lesson number one. Sometimes when you’re chipping you need to put on spin so the ball will stop. Other times you need to take spin off so the ball will run. Ask the pro how you hit each shot, with the same club. Sometimes you would like to bend the ball a little bit into a tucked pin. Other times you need to bend the ball a lot around a tree. Learn both shots, curving left or right. Find out how to do that. Hitting shots into the green with a higher or lower trajectory will get you closer to the pin by design rather than by chance. With a pin in front, a high shot that sits quickly is best. A lower shot that releases is how to get to a pin in back. Hitting into an elevated green calls for a higher trajectory. Controlling trajectory is a vital skill for playing on a windy day. All of this is the fourth lesson. None of these things are difficult to do, and winter is a good time to learn how. Your teaching pro will be delighted to spend time with you on these matters, since few golfers ask about them. Afterwards, just keep these skills in practice to be in command on the golf course. One reason why the golf swing is so difficult is that many golfers do not have a good idea from one day to the next just exactly how they swing the club. They often rely on the groove they got into last time at the range, but the move they thought was The Difference can’t be found the next time out. Now what? You would have to have daily lessons and daily practice to remember every detail in your golf swing and know just what to do to correct yourself when something goes wrong. The best bet for a recreational golfer is to remember how to perform five critical parts of the swing and just work on performing them the same way every time. If so, what happens in between has to be happening the same way, too. The five parts of the swing to remember are: the takeaway, the end of the backswing, the start of the downswing, impact, and the finish. Takeaway defines your club path and the plane of your backswing. The end of the backswing is the furthest limit of your being able to feel that the clubhead is still connected to the ball. The start of the downswing can be led in many ways, but never with your hands. Impact is, of course, impact, but it is a dynamic position, one of moving through, not of arriving at, a spot. The finish is where this all leads to. When the finish is right, likely everything that came before it was, too. You can practice each one of these positions separately. The task is to memorize what each one feels like, installing the feeling into our subconscious awareness so that the movements in between will automatically seek the next position. When you play, you could take a slow practice swing to rehearse hitting all the right feelings. Good golf is not played by having a great swing. It’s played by making your best swing more often. Learning these five basic positions, given a fundamentally sound grip, stance, posture, and alignment, will take care of that. anyone play gi irons in their long irons? These are good questions that deserve good answers. Most of us feel comfortable up to about 160 yards and then from 200 yards and up. It’s that gap that we find difficult to fill. We’re still trying to hit the ball a selected distance, and straight, and that’s not easy for a recreational golfer to do. You have two options in terms of equipment — long irons or hybrid irons. Long irons were what I grew up playing with. Iron sets came 2-9. The pitching wedge was a separate purchase. In those days, instruction books had sections, and golf magazines had tips, on how to hit your long irons. There were as many of those articles then as there are “How to get out of a bunker” articles today. They were the clubs recreational golfers just couldn’t get off the ground or hit the distance advertised. It’s the same thing today. Long irons are still hard to hit. I can hit a good shot with my 4-iron about two out of three times, with my 3-iron about one out of three times, and my 2-iron is strictly to be hit off a tee. At least that’s what I would have said if you had asked me eight years ago. I went to a Ben Hogan demo day at my driving range and tried out one of these new hybrid clubs. I borrowed a 3. The first ball I hit, with no expectations, was as good as any 3-iron shot I had ever hit. Same thing for the next two balls. Three rockets in a row. I needed no more convincing, and a few weeks later bought a 2, 3, and 4 Ben Hogan hybrid, which I still use in addition to the 5 which I picked up three years ago. So let’s get to those questions. faster swing speed with long irons — you definitely need a high swing speed to hit these clubs well. If your drives carry about 250 yards, that’s 250 in the air, not air plus roll equals 250, then you have enough swing speed for a long iron to give you its due. You don’t swing faster with a long iron. You swing with what you have. If you don’t have it with your driver, you don’t have it, period. how far do you hit a 4-iron — as far as I hit my 4-hybrid, but not nearly as often. anyone play gi irons in their long irons? — honestly, if you use gi irons, you don’t have a long iron swing. Sometimes I take my long irons to the range and hit them just for fun, but I would never play with them. There’s no reason for you to, either, not when you can use clubs that are so easy to hit it’s almost cheating. When Keegan Bradley won the PGA last summer and used a belly putter, and Webb Simpson won twice with the same, the BP controversy erupted. Everybody had an opinion about the long stick, and I wrote the definitive piece myself. In the December 2011 Golf Digest, there is a huge section about the pros and cons of “unconventional” putting. The people who say that anchoring the putter to your body in some way, “Just isn’t golf,” are probably just upset because they didn’t try it themselves sooner. I don’t mind if you anchor the putter. If you want to get a long driver and anchor that, fine with me. We don’t anchor the club we swing because if you want to hit the ball a long ways, you have to wind the club around your body and unwind it back around so you can give the ball a good whack. That’s physics, and that will not change because there’s no other way a human can hit the ball a long way. On the putting green, though, you’re not trying to hit the ball a long way. You’re trying to coax the ball across a manicured surface into the hole. Winding the club around you isn’t the swing model that applies here. Why would anyone think it should? Why would anyone think that because you have to hit a 5-iron in a particular way, that you automatically have to hit a completely different shot using a miniature version of that same way? Another argument you hear is that the belly putter gives the players who use it an unfair advantage. Over . . . ?? Players who don’t use one? Then they should use one! All the grousing comes down to tradition. Ah, tradition. The way we have always done it. It was good enough for me, so there’s no reason to change things. What about the records, etc. Well, there is only one tradition in golf. That is, you hit a ball sitting on the ground with a stick, with your own effort, until the ball goes into a hole. Period. As long as that doesn’t change, it’s golf. Let’s not forget that more than fifty percent of putting comes down to how you use your mind. 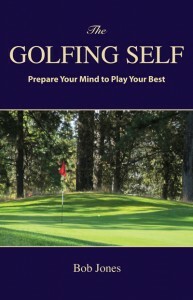 People who think that a different style will revolutionize putting are neglecting the power of the mind in playing good golf. Which would help you sink more putts — a different club, or more confidence? All the grousing over the belly putter neglects that first fundamental. You can belly putt all you want, but if your mind gets agitated on the green, I’ll beat you one-handed with my Bulls-Eye. This variable is so critical to hitting your best shot and it is so easy to get right. Along with grip and aim, getting ball position right makes the difference between success and failure before you even start your swing. You can get everything else right but if the ball is in the wrong position for your swing you will only hit a weak, glancing blow and be robbed of your full power. There are two dimensions to ball position — how far it is away from you, and where it sits forward or back of the center of your stance. Figure out how far away the ball should be by setting up without a ball. Swing a few times and watch where the top of the club flashes past you toward the target. That is where your swing delivers the clubhead, and that is where the ball goes. Simple. The forward and back matter is also easily resolved. Harvey Penick told us in his Little Red Book that all you have to do is pick up the club, take your grip and stance, and set the clubhead down on the ground. It will go by itself to the right place. Try it. Pick up your 7-iron, take your grip, get into your stance and lower the club to the ground. It will probably land in the center of your stance, midway between your left foot and your right. Now do the same thing with a 3-iron. I would bet that if you do nothing to influence the outcome, the club will land about two balls in front of center — about halfway between the center of your stance and the inside edge of your left heel. You have read that longer clubs need to be played progressively closer to your left heel, but you were never sure how close. This method shows you. Remember, don’t take this little detail for granted. Ball position is a critical element of good ball-striking. Get it right before you make any stroke at the ball. Handicap golfers get into trouble by hitting shots with clubs they can’t handle well. I’m thinking of the longer clubs, the driver and the long irons/hybrids. Because these clubs have a straighter face, sidespin is accentuated, exacerbating your slice or hook. Because you’re aiming at targets fairly far away, identical errors in accuracy are magnified relative to shorter clubs. Never use a club that has less loft than your average score over par. If you aren’t breaking 100 (28 over par), the 5-iron (32 degrees of loft) is your big gun. Break 90 regularly and you can move up to a 2-iron/hybrid. Drivers are for golfers who break 80. By following this rule, the ball will be in the fairway much more often because you will be hitting straighter shots. Trade occasional distance for habitual accuracy, and you will get to the green in fewer strokes than you do now. Yes, you won’t be shooting for par on every hole, but since you’re a handicap golfer anyway, par is not always your expectation. What you will remove from your scorecard are the doubles and triples. You will also learn more about playing the game because your ball will more often be in a position for you to play a hole by attacking it rather than by recovering from wayward shots. I know the driver is loads of fun and it feels great and you impress your buddies when you nail a long one. But if you want to shoot a lower score than they do, this might be the way to go. Unless you live south of the 35th parallel, you aren’t playing a lot of golf right now. That’s good. It means you can take the time to practice three shots which, if you get really good at, are going to cut strokes off your game by the relative fistful. These shots are the 7-iron approach, the chip from 10-25 yards, and the 30-foot approach putt. If you can hit the first one well, then all you have to do is get the ball past the 150-yard marker and your next shot will put the ball on the green. The second shot covers the chips you hit more often than the greenside chip, and is the shot that I would guess loses you more strokes in your short game than any other. Get 30-foot putts close and you will cut way down on three-putt greens and become a better putter from everywhere else, too. When you go to the range, take a 7-iron, a sand wedge, and a putter. Practice these three shots only. In a one-hour visit to the range, spend twenty minutes on each one. These are not the only areas where you lose strokes regularly, but they are the easiest places to get lost strokes back with dedicated practice. Notice that I didn’t say anything about the driver. You do have to get the ball in the fairway or what you do next to the green won’t count for much. So hit a fairway wood or long iron off the tee with your 7-iron swing. Keep the ball in play and make some putts. It’s a simple game. I check out of pro golf every year after the PGA is over. The Ryder Cup, Presidents Cup, Solheim Cup, those events don’t do much for me. After the PGA is finished in August, all the men’s and women’s majors have been played and it’s time for college football anyway. So every year it takes me a little while to get used to how good the pro golfers are. I watched the third round of the Sony Open yesterday, and I’ll watch the finish today because 18 guys are within four shots of the lead on a course where low scores will be plentiful. 1. How hard they and fast they swing, such as the current co-leader, Matt Every. 2. How dead straight they are. Nick Faldo showed us the 8-yard-wide opening to the 18th green that players have to navigate from about 250 yards away. I lost count of how many golfers bounced the ball onto the green right through that gap from that distance. 3. How important every putt is. The moment I tuned in I saw a guy miss a three-footer and a few minutes later saw someone else miss a putt of the same length. 4. How much I want to go to Hawaii this time of year. For the past several years the official opening of my golf season has been to watch Bubba Watson jump out of his shoes cutting the corner with his drive on 18, but he’s not in the tournament this year, so I guess we won’t get to see that. The group I would follow today if I were there is the Corey Pavin and Chris DiMarco duo. I would learn a lot about how to play golf, and there wouldn’t be that many people in their gallery, so I would get to see everything. One thing about pro golf that I hadn’t forgotten, and that I saw plenty of yesterday, is that to shoot a score you have to keep the ball in play and make some putts. My son, who is 35 and learning to play, calls me after every round. We go over which shots didn’t work out in order that he might learn better ways of getting the ball around the course. Right now my thing is for him not to tee off with any club longer than a 4-iron. He’s doing that, and finding out how different golf is when you hit second shots from the fairway. But, back to golf. There’s snow and ice on the ground in the Pacific NW today (see #4, above), which means putting practice indoors and the Sony Open at 4 this afternoon. Life is good. I got my new rule book from the USGA in the mail today. This book is the result of a close collaboration between the USGA and the R&A, and was published with both sets of readers in mind. The copy inside is distinctly British, using a Gill Sans typeface, common in Great Britain, but not over here, which makes the Rule book much easier to read than before. Penalties are in red type, making them easier to notice. If you need glasses to read with, though, the size of the typeface could be problem on the course. mend studying this section until it is thoroughly understood. The principle rules changes are on pages 6-8, and were discussed in this space last fall. You should be able to get a copy of the new rule book at your local pro shop. Carry one in your bag. ification. You can’t be disqualified from a social round of golf, but you can be prohibited from turning in your score for handicap purposes. Anyway, holing out is the right thing to do because it just is. My take on the rules? If you’re just out there to knock the ball around, who needs rules? But if you keep score for any reason, follow them. 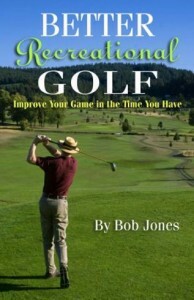 Recreational golfers throw away shots every round by not being prepared to play the course. Every shot has options. Choosing the wrong option or the wrong club causes you to play extra strokes that didn’t need to be taken. The best way to prevent this from happening is to make a plan, before you get to the course, for how you’re going to play each hole, for better or for worse. The fewer on-the-spot decisions you make the better. Base your plan around the shots that you hit well. Plan your round to hit those shots as often as you can. Your plan should consist of the club you’re going to tee off with and where you’re going to hit the ball, and the club you’re going to use from the fairway and where you’re going to hit it, that is, favoring which side of the green. That might not be the side where the pin is if the price for missing on that side is too high. That’s Plan A. You also need a Plan B, which you pull out if Plan A doesn’t work. When you’re in trouble is not the time to be thinking. Know ahead of time what you’re going to do if you tee off into the trees on the right on #10. Know which club you’re going to use and what shot you’re going to hit to get the ball back into play. You might have two options prepared, one for when there’s a way to advance the ball, and another for when you just have to punch out. Either way, know what you’re going to do and how you’re going to do it before you ever get to the course. All eighteen holes should be thought out in advance like this. Plan B is not that hard to figure out, because if you play a course often enough, you know where your misses go and where they don’t go. If you’re playing a course for the first time, you can’t make plans, so rely heavily on your best shots. Hit them as often as you can and see what happens. As you do, plot out the course by writing down which clubs you would like to use next time and where the safe spots to hit to are. Mark these spots with a felt pen on the course map on the back of the scorecard. If making detailed plans is not your thing, at least keep a notebook in your bag with a list of clubs you use off the tee, hole by hole, of every course you play. That in itself puts you way ahead of the game. 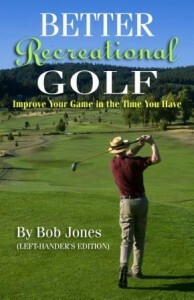 Better Recreational Golf has more good playing tips. check it out.